Pictured is an example of an Ideal Easy Fit Patio Panel. These durable panels are adjustable to fit various sizes of sliding patio doors, have safety glass, weather strip for a tight seal, and a security lock. Give us a call at 800-749-9609 and we’ll help you find the perfect door for your home. 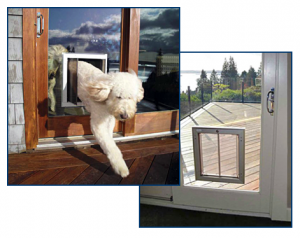 It is also possible to install a PlexiDor cat door or dog door in glass. This solution combines all the benefits of a high-performance pet door with the beauty of seeing outside. The PlexiDor is durable, energy efficient, safe, and easy for pets to use. Glass doors and windows use tempered glass that can no longer be cut, so it isn’t possible to just make a hole and put a pet door in it – the solution requires getting a new pane. For more information on installing a PlexiDor through a glass door or window, please visit www.plexidorglass.net – they can install in patio glass and french door glass. These are custom installations that give a great result. The cost is usually between $1,200 and $2,000.